Spy Theories and the White House: Donald Trump as Russian Agent - Integration Through Media ....! The level of absurdity in US politics has now reached such vertigo inducing levels as to render all manner of things permissible. Contact with the unwashed implies collaboration; discussion with the enemy implies assent. To go to a dinner party with a perceived hostile force in the context of business of diplomacy has become a child’s condemnation of misplaced loyalties. Yet everyday, thousands of engagements are made between powers and interests where nothing other than a hello is exchanged, or a pleasantry. Perhaps the more relevant question to ask here is that businessmen and women in power suggest the limits of the nation state and representation: to what extent can such figures claim to be legitimate as figure who think outside the logic of money and finance? Such theatre leads to such levels of gabbing as to be moronic. The president might be a Russian agent, because the FBI opened a counterintelligence investigation in 2017 on Trump. Pause for laughter. The President was investigated by that glorious agency of record, the FBI, for suspected links. Pause for befuddlement. 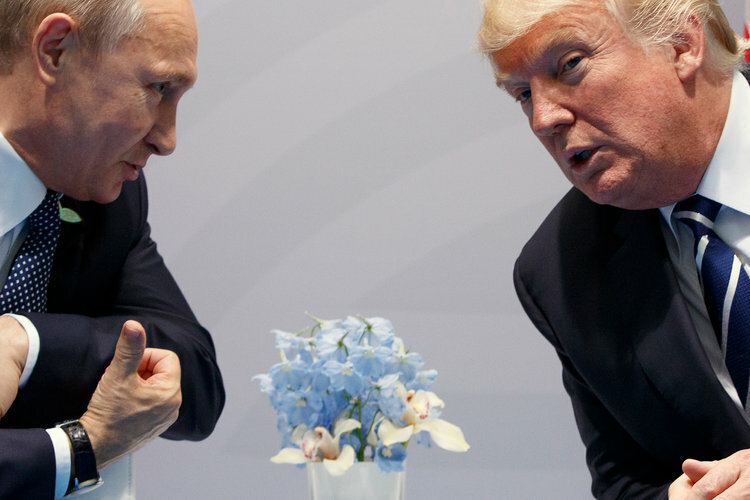 The Washington Post then ran a story claiming that Trump had gone to extensive lengths to conceal, even from his own aides, his interactions with Russia’s Vladimir Putin. Tax payers’ funds, it seems, are being used for the most notable of ends. Wired was similarly speculating along such lines, with a twist: Trump’s actions had been “pro-Putin, pro-Russia, anti-FBI, anti-intelligence community”; he had lied and engaged in obfuscation around Russian meetings and conversations; he must be hiding a “massive conspiracy”. Better that he be a Russian agent than the alternative, which was supposedly worse: a figure oblivious to geopolitics, self-centred, insecure, anti-democratic and a terrible manager. Interesting here is how such a view is oblivious to remembering other US presidents whose anti-democratic, oblivious, self-centred tendencies were as developed, if not worse than a businessman turned populist. But such views are cured in the vinegar and salt of intense prejudice and presumption: the enemy is in Moscow, and must be condemned. Better this be done than understanding Trump’s erring and bumbling as a product of a true US capitalist; he is seen as an American gone bad, an anti-patriot. Donah Goldberg of the Boston Globe tweaks the approach on the spy conspiracy theory – slightly. “When was the last time a popular and contentious conspiracy theory turned out to be true? Not a little true, but, like, really true?” Think of Whittaker Chambers and his outing of Alger Hiss for being a Soviet spy. He dismisses the views of Jerome Corsi, shooting bolts of manic persuasion from Infowars, claiming that the president is a target of the Deep State, including its emissaries, the CIA and NSA, determined to unseat him. But Corsi’s comments should be taken in the broader readings of antipathy against Trump which have legitimised the most extreme approaches to unseating and overthrowing an elected figure. No one in high office is suggesting a grand assassination or beheading, but not a day goes by without some casual articulation of symbolic regicide. Trump must go, so goes the narrative.